This site was published on August 10, 2010. There has been 61340 visitors since then. The 12th Paris Workshop. 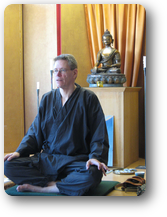 November 17-18, now officially at the Chikumeisha Lesson Center in France. Symposium at SOAS on July 30, and Gala Opening Concert at Union Chapel on July 31. The 11th Helsinki Workshop. March 16-18, 2018. The 11th Paris Workshop. June 1-3, 2018, in Figeac, France. A performance of "Shizue" by Joseph Swensen with the Porto Symphony Orchestra at Casa da Música in October 2014 is available on YouTube (see also Performances 2014). Here you can listen to the performance. Here you can hear an interview with the composer Joseph Swensen. Professor Thomas Hare & Gunnar Jinmei Linder. Examining Committee members (seated) Professor Håkan Lundström and Professor Marie Söderberg. The third member of the Examining Committee, Professor Barbro Klein, is not visible in the picture. 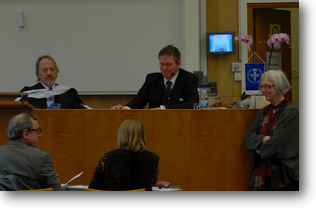 To the right (standing), Professor Gunilla Lindberg-Wada. Workshop in Helsinki, 2011 .. Interested in SKYPE-lessons? Please contact me for details. The book on advanced honkyoku performance techniques (see Writings for details) is now available through Taihei Shakuhachi. Samples of all ten pieces are available both here (see Writings), and on the Taihei Shakuhachi site. Here you can find a complete listing of pieces covered in the basic repertoire (shihan) of Kinko-ryū Chikumei-sha Shakuhachi. Longer section of two pieces. More samples under Recordings. I hope to be able to update "Writings", including articles to be published at the university in Prague. The articles are based on the papers I delivered during the Conference part of the Festival in Prague in 2010, 2011, and 2012. One paper deals with an outline of a structural analysis of the phrase in honkyoku. A second paper deals with the issue of rhythm in honkyoku, and a third article is planned to discuss the sankyoku from a social perspective. I am now also working on an analysis of some of the song texts within this genre. 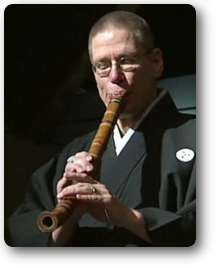 In my PhD I have written extensively about the historical aspects of the shakuhachi, and one article about the boro and the komosō was also published in a previous number of the ESS Newsletter. Under "Writings" you can also read about my book Notes on Kinko-ryū Honkyoku. The book includes ten (10) Kinko-ryū honkyoku pieces, with detailed phrase-by-phrase explanations on performance techniques. There is also a chapter relating to my research in structural analysis of phrases. I have added some samples from the three CD's included with the book on the homepage (see Writings), as well as some sample pages from the book. The three CD's that come with the book of course include all ten pieces covered in the book (book published in 2011). I have added explanations to the pieces on the three CD albums that appear under "Recordings". So far, I have added three samples for each of the three albums and more samples will be added later. The password protected page for downloading workshop material for workshop participants (see Downloads), and the pages for Online lessons are getting updated gradually. The preparations for online tutorials are proceeding. This homepage is built with the Japanese software Quick Homepage Maker (QHM), and the time given here is Standard Japanese Time in 24H display. This software is very useful and you can create your homepage easily, directly in your web browser. If you are interrested in this software, QHM, please click on the link below. The site is only in Japanese.